Hector launches new events concept 'Vatos Locos', which is set to showcase for the first time at the BPM festival in Mexico, on 17 January. Vatos Locos is an event concept created by Hector that brings together the main driving forces behind his creativity, music, lifestyle, culture and tequila. 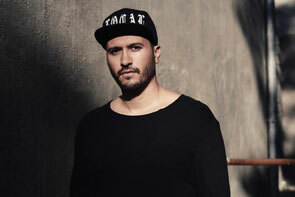 The name has followed him around over the past few years and has developed into an organic translation of the energy that Hector personifies with the music he produces, his personal clothing style, and his DJ performances. It didn't take long for others to jump on board as gig after gig, fans around the world would apparently show up representing their own Vatos Locos custom printed t-shirts, signs and numerous other paraphernalia. Hector knew he was onto something here, but there also had to be a reason behind what all of this represented. A common thread connecting everything together... a sense of purpose. In the end, it was actually quite simple! With a name like Vatos Locos, you cannot hide from the cultural subtext that the name suggests. Tattoo script, low riders, loose-fit clothing, Latino vibe... it's all there. Applied to the event concept, it's simply about enjoying life which in essence what Vatos Locos is all about. Great sound, DJs, music, friends, energy, letting loose, escape... and most importantly, having fun.